In a small bowl whisk to combine cornstarch with 3 tablespoons of water. Transfer to a medium saucepan and whisk in soy or almond milk, Monk Fruit In The Raw®, and matcha. Stir mixture constantly over medium heat with a silicone spatula until it comes to a boil, and cook 1-2 minutes, stirring constantly until pudding begins to thicken. Remove from heat and stir in vanilla and coconut extracts and food coloring, if using. Pour pudding into a bowl, press plastic wrap directly on surface, and refrigerate until completely chilled, at least 2 hours. Remove pudding from refrigerator and stir with a spatula until smooth. Divide pudding between small cups, ramekins, or glasses. 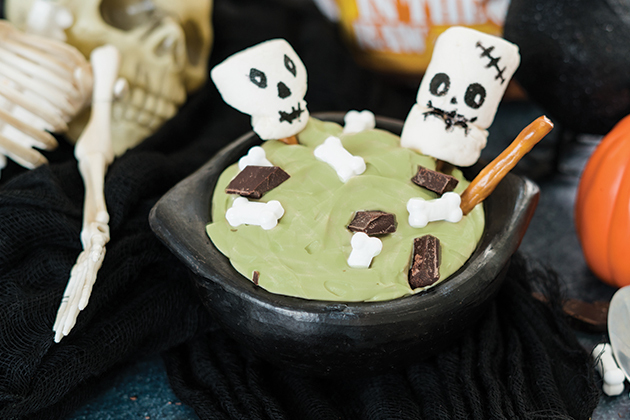 Sprinkle candy eyes and bones and chocolate chunks over puddings, and stick a pretzel in each one. Serve immediately or chill up to 4 hours.